Daniel Silva will sign and discuss his new book, The Heist (Harper; $27.99). Daniel Silva is the award-wining, number one New York Times bestselling author of The Unlikely Spy, The Mark of the Assassin, The Marching Season, The Kill Artist, The English Assassin, The Confessor, A Death in Vienna, Prince of Fire, The Messenger, The Secret Servant, Moscow Rules, The Defector, The Rembrandt Affair, Portrait of a Spy, The Fallen Angel and The English Girl. His books are published in more than thirty countries and are bestsellers around the world. He serves on the United States Holocaust Memorial Council and lives in Florida with his wife, Jamie Gangel, and their two children, Lily and Nicholas. EVENT GUIDELINES: Silva will allow photos, but fans will have to lean in from the front of the table to get their picture taken. (No posed photos). Silva will sign copies of The Heist and 3 older titles per person. Due to the size of the crowd, there will be no second round. The Heist goes on sale July 15th. Line Numbers for the event will be available starting that day. A copy of The Heist must be purchased from MBTB in order to obtain a line number and get anything signed. Seating and parking are first come, first served. Please note that Silva draws one of our biggest crowds every year. Chairs will be put out at 3:00 p.m. on the day of the signing. Seven days One girl No second chances Madeline Hart is a rising star in Britain's governing party: beautiful, intelligent, driven by an impoverished childhood to succeed. But she is also a woman with a dark secret: she is the lover of Prime Minister Jonathan Lancaster. Somehow, her kidnappers have learned of the affair, and they intend to make the British leader pay dearly for his sins. Fearful of a scandal that will destroy his career, Lancaster decides to handle the matter privately rather than involve the British police. It is a risky gambit, not only for the prime minister but also for the operative who will conduct the search. You have seven days, or the girl dies. Enter Gabriel Allon--master assassin, art restorer and spy--who is no stranger to dangerous assignments or political intrigue. With the clock ticking, Gabriel embarks on a desperate attempt to bring Madeline home safely. His mission takes him from the criminal underworld of Marseilles to an isolated valley in the mountains of Provence to the stately if faded corridors of power in London--and, finally, to a pulse-pounding climax in Moscow, a city of violence and spies where there is a long list of men who wish Gabriel dead. From the novel's opening pages until the shocking ending when the true motives behind Madeline's disappearance are revealed, The English Girl will hold readers spellbound. It is a timely reminder that, in today's world, money often matters more than ideology. And it proves once again why Daniel Silva has been called his generation's finest writer of suspense and foreign intrigue. Ticket Guidelines: Vouchers are available for this event at Books & Books in Coral Gables, Miami Beach and Bal Harbour Shops. You can pick them up in person, order them online, or call the any of these store locations and have one reserved for you to pick up at will call the night of the event. Your purchase of The English Girl ($27.99 + tax) entitles you to receive (1) one copy of The English Girl and also serves as your entry for (2) two people to Daniel Silva’s talk and book signing at Temple Judea. The English Girl will be published on July 16 and you may claim your copy of the book any time after publication at a Books & Books location, or at the event on July 22. Your voucher will be stamped to reflect whether or not you have claimed your book. You must show your voucher and attached receipt to claim entrance to the event, so please remember to bring it with you that day. Books & Books is NOT responsible for lost or stolen vouchers. About the Author Daniel Silva is the #1 New York Times-bestselling author of The Unlikely Spy, The Mark of the Assassin, The Marching Season, The Kill Artist, The English Assassin, The Confessor, A Death in Vienna, Prince of Fire, The Messenger, The Secret Servant, Moscow Rules and The Defector. He is married to NBC News Today correspondent Jamie Gangel. In 2009 Silva was appointed to the United States Holocaust Memorial Museum Council. Click below to purchase your voucher online. Be sure to pay online now and then you may choose the store pick-up option if you would like to pick your ticket up at Will Call. Art restorer, assassin, spy—Gabriel Allon returns in The Fallen Angel (Harper, $27.99) , another blockbuster espionage thriller from #1 New York Timesbestselling author Daniel Silva. The acclaimed author ofPortrait of a Spy, Silva ("a world class practitioner of spy fiction" —Washington Post) is an undisputed master of the genre who has brought "new life to the international thriller" (Newsday). A breathtaking adventure that races around the globe, The Fallen Angel begins in Rome, where Allon is called upon to investigate a murder at the Vatican, one with disastrous repercussions that could plunge the world into a conflict of apocalyptic proportions. If you haven't yet been drawn into Daniel Silva's thrilling universe of intrigue, danger, and exceptional spycraft, start here—and see why the Philadelphia Inqurer declares that, "The enigmatic Gabriel Allon remains one of the most intriguing heroes of any thriller series." FREE tickets available at our Coral Gables, Miami Beach, and Bal Harbour Shops locations. Presented in collaboration with The Center for Literature and Theatre at Miami Dade College. Daniel Silva reads from Portrait of A Spy. Daniel Silva reads from The Rembrandt Affair. Daniel Silva , The Defector. Daniel Silva promotes The Defector. Born in Michigan, raised and educated in California, he was pursuing a master’s degree in international relations when he received a temporary job offer from United Press International to help cover the 1984 Democratic National Convention in San Francisco. Later that year Silva abandoned his studies and joined UPI fulltime, working first in San Francisco, then on the foreign desk in Washington, and finally as Middle East correspondent in Cairo and the Persian Gulf. In 1987, while covering the Iran-Iraq war, he met NBC Today National Correspondent Jamie Gangel and they were married later that year. Silva returned to Washington and went to work for CNN and became Executive Producer of its talk show unit including shows like Crossfire, Capital Gang and Reliable Sources. In 1995 he confessed to Jamie that his true ambition was to be a novelist. With her support and encouragement he secretly began work on the manuscript that would eventually become the instant bestseller The Unlikely Spy. He left CNN in 1997 after the book’s successful publication and began writing full time. Since then all of Silva's books have been New York Times and international bestsellers. His books have been translated in to more than 25 languages and are published around the world. Silva continues to reside in Washington with his wife and teenage twins Lily and Nicholas. When not writing he can usually be found roaming the stacks of the Georgetown University library, where he does much of the research for his books. He is currently at work on a new Gabriel Allon novel and warmly thanks all those friends and loyal readers who have helped to make the series such an amazing success. Daniel Silva, his wife, and children, live in Washington, DC. 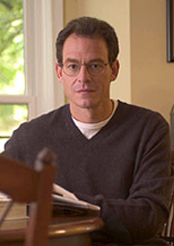 Daniel Silva is currently considered a "single author." If one or more works are by a distinct, homonymous authors, go ahead and split the author. Daniel Silva is composed of 5 names. You can examine and separate out names.